We’ve hit the springtime good weather streak and warmer temperatures are here to stay. At Salty’s we are firing up the grill for you every day, rain or shine. On it we are sizzling up a plethora of delicious foods and one of them is beef. Since our chefs just got back from inspecting our Texas beef producers, I thought you might like to know some nutrition information about what we are serving. At all of our Salty’s restaurants, we only serve Certified Angus Beef Natural®. Each one of these words means something very important. Angus Beef is of course the breed of cattle. Certified means it has gone through a stringent scientific ten-step quality standards process. The last word “Natural” is the most important part. This designation guarantees us that “the Cattle are never given antibiotics or added hormones (never), and they’re never fed anything but a vegetarian diet. 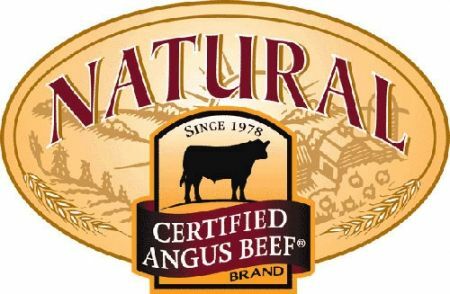 Our Certified Angus Beef Natural® brand label offers premium Angus beef, naturally. These “nevers” are very important to us and to our overall health. We also don’t want hormone additives in our foods because they involve another controversial health issue. Scientists don’t know what all the long-term effects of hormones and antibiotic additives are but we do know some unfavorable information. Every time bacteria encounter an antibiotic, they fight hard for their life and in the process either die or become stronger. Each encounter is like a workout in the gym and over time bacteria becomes “muscled up” and very resistant to known antibiotics. This requires the development of more aggressive antibiotics and in some cases there are no antibiotics strong enough to fight the bacteria, in which case it is designated as a “super bug.” This is a dangerous health concern for us globally. The more we demand that our food system does not contain antibiotics, the less there will be in the marketplace. We also don’t want hormone additives in our foods because they involve another controversial health issue. Their reason for industry use is to promote quick weight gain and maturation of the animal. Some believe that this process transfers to humans and can be associated with such things as cancer growth and early puberty in children. Why take that chance? And lastly, a vegetarian diet for the cattle is the way cattle are meant to eat. Adding animal proteins that are not normally part of their diet is naturally, very unnatural. Eating beef can be a great source of not only protein for strong muscles and tissues, but also zinc for a healthy immune system, phosphorus for strong bones and teeth, iron to increase our oxygen carrying capacity and B vitamins (including the hard-to-find B12) for energy access and release. These are all very important nutrients. Good health is found in eating a wide variety of natural foods. So every now and then, when you are not eating fish and vegetables, eat some “never, never, never” always-natural, highest-standards beef. We even do the cooking!